We are looking forward to talking with you. In the meantime, we thought you might like to know a little more about us, what we do, and why our clients like dealing with us. Imagine taking the pressure off your mortgage repayments and developing an investment property portfolio. That’s exactly what we have helped hundreds of clients do. It’s far more possible than most people think – and you don’t have to be super-wealthy or take ridiculous risks. If you have $65,000 or more equity in your home, we can probably help. Over the last 17 years, we have helped thousands of people like you climb out from under their mortgage and start making their family home start working for them. We help regular Victorians build a portfolio of properties that can pay down your family home mortgage, reduce your tax, and move you toward financial freedom. To find out how we can help you, simply book your free, personal, Kickstarter Session now and start the New Year on the right foot. Rhys works in the NT and WA and invests in Melbourne. We have helped him use his income to build an impressive property portfolio. In the process, his investments have also served to significantly reduce his tax. Finvest founder Lisa Harris developed a passion for real estate investing early. She went into partnership with her mum to buy her 1st property purchase at 21, and started a full-time career in mortgage brokerage at 22 years old. She is still investing today, with a thriving investment property portfolio. In 2011 Lisa took the career change she had always had a passion for, the niche of Investment Property. Over the past 8 years, Finvest has gone from strength to strength. In that time we have helped hundreds of clients successfully enter the investment property market and build for their futures. Here’s a free guide to get you started. 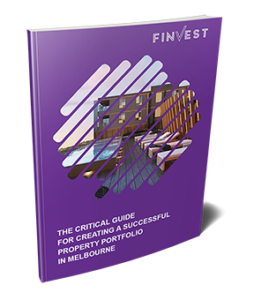 This guide tells you more about our approach and contains handy tips and hints specific to the Melbourne market. We understand that starting a portfolio can be a big step – and we are there with you all the way. Download your free guide here. It’s time to stop putting it off. The first step toward your independence is your obligation-free Investment Kickstart Session.